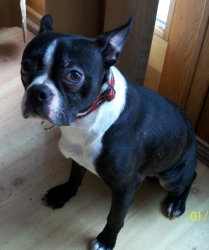 Willie he is a nine month old male Boston terrier. He is a typical puppy, full of energy and playfulness. He is sweet and loves his ears scratched. Because of his boundless puppy energy he neededn a family that will keep him busy. Willie lived his first 6 months with a "breeder” who was going to put him down because he wasn't selling. Luckily he was saved and released to a rescue. Our belief is he lived in a crate those first 6 months. Fortunately, Elly Monfett offered to foster Willie and work with him on basic puppy training. 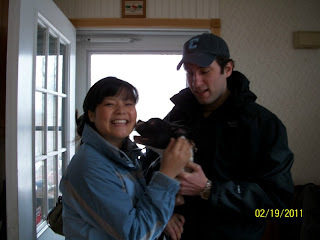 He has now gone to his forever family with Elizabeth Yan. Don't they all look happy in the picture at the top of the page? We had a quick slide down and before we all knew it, we were saying goodbye to our beautiful Miss Moo.... We helped her cross on Friday evening...she was in my arms snuggled close to my heart and she went peacefully, released of her pain and confusion. She came into our lives, reluctantly on our part on Aug 15, 2009. We had a few beautiful months with her and Tink and then she helped us transition after Tink crossed the bridge. 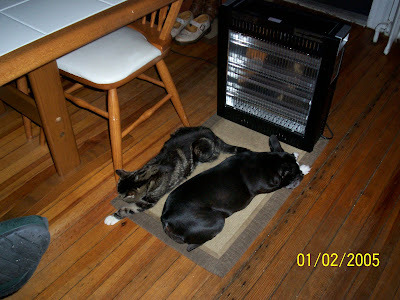 She helped Ori learn all the things she needed to learn as a dog in our house beginning when Ori came to us in Jan '10. And for just over a year we had "our girls" Ori and Molly. Molly being top dog and reminding O from time to time. Ori and Moo made a great pair. Ori made a mess of whatever she was playing with and Molly ate the mess if we weren't fast enough. We fell for Molly fast. I used to tease Nick that she was Molly's boyfriend. She was easy going and over the past year and a half learned to snuggle and love and be an important part of our little family. And in a blink of an eye, our time with her is up. She had a beautiful retirement with us. We couldn't have asked for anything more, but of course we always want just a little more time. Just one more pain free day.... Another beautiful golden girl left her paw prints forever on our hearts. I wouldn't trade our time for anything. She was another gem, another reminder of the good gifts we are given. Miss Moo run fast and free, free of pain. Give Tinker my love; let her know I think of her every day. Teach her how to sing and always remember how much we love you. Molly Wigglesbottom: Born Aug 29, 1998. 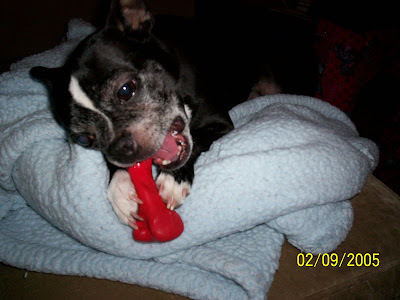 Loved with us from Aug 15, 2009 to February 11, 2011 and beyond. We will always remember you darling. 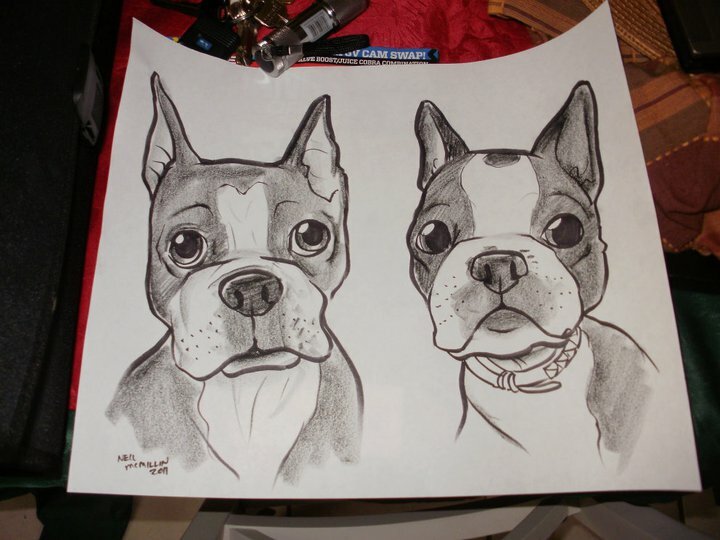 Right after Christmas in 2009 a young lady contacted NEBTR asking if we could take her 2 Bostons. She and her mother (who had cancer) were being evicted from their home and she has been trying desperately to have friends or family to take her girls with no success. We have had Princess for a year now and while that time has been filled with ups and downs, we would not trade her for the world. She is a wonderfully sweet and loving dog. She loves to cuddle and curl up in a soft blanket. She has formed a very strong bond with our daughter and curls up in bed with her every night. We did have to go to some private training sessions when Princess first arrived where we discovered that she has some resource guarding issues. Initially that was quite worrisome since she started several fights with our other Boston Sweetpea. But after the training sessions and with a lot of patience, persistence and love she is improving. The two of them can now lay on opposite ends of the couch with very little fussing. Princess still gets nervous and anxious that Sweetpea is going to take her toys or attention, but there is not a day that goes by that we ever regret bringing Princess into our home. She is just so sweet. And every week we see improvement in her relationship with Sweetpea. When we first brought Princess home she was so underweight that we could see the bones in her spine and her ribs, and she had patches on her hind legs and tail where there was little or no fur. Now she is a very healthy 23lbs and her coat has filled in beautifully. She looks like a totally different dog! We've attached some pictures of her sleeping in her favorite spot on the couch. She loves to sleep there with her favorite toys tucked into the blanket with her. 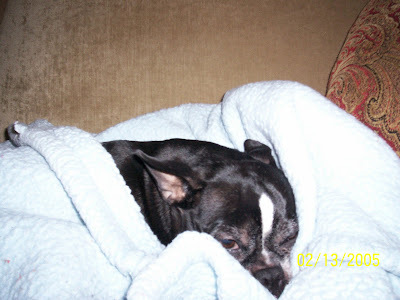 It is very funny to watch her burrow into the blankets and to listen to her contented groans when you rub her belly or scratch behind her ears. She also loves to be picked up and will nuzzle her head onto your neck and shoulders. 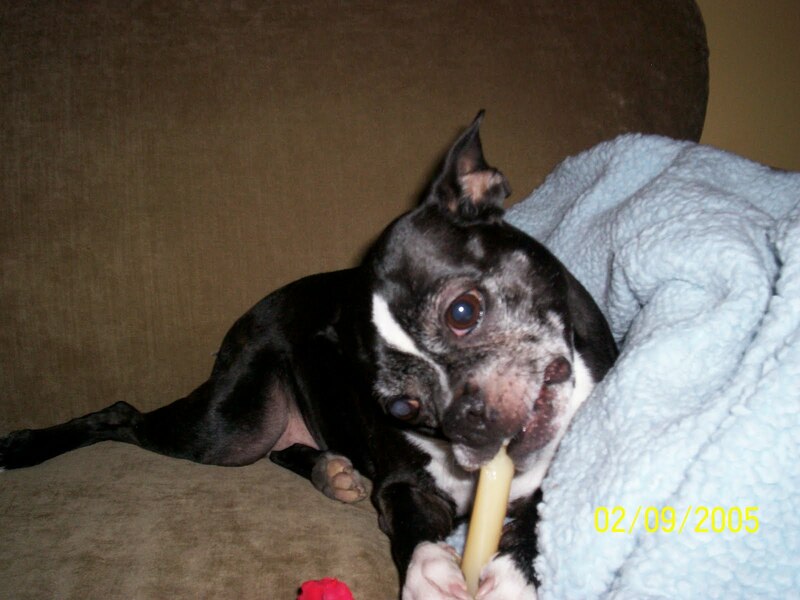 We cannot thank you enough for helping to bring Princess into our family. We are looking forward to many wonderful, happy years ahead with her. Caricatures of Penny, Cleveland and Cliff from the Pet Expo in Allentown PA! Cliffy was a star there. He had lots of people interested in him, and has now gone to his forever home! We are having a raffle. 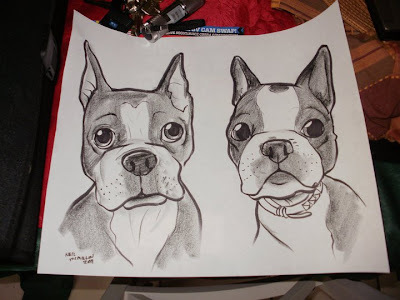 Last year we helped 93 Boston Terriers get Veterinary care and find forever homes. This year we will probably surpass that number. 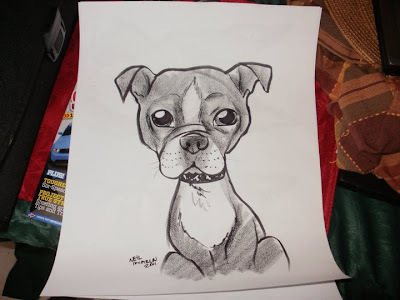 Having a raffle helps us continue helping all dogs that come our way. Sometimes we need your help. We have 7 autographed copies of “You Had Me at Woof”. All 7 are signed by the author Julie Klam, who is an NEBTR volunteer too. The deadline is March 18, 2011. You can read here information on the book, and the winners will be posted after the raffle is over. Be sure to have your name, address and tel number on the stub that you mail. Kim and I picked up Buddy 6yrs., Sparkira 10 yrs. and Sasha 9 yrs. earlier today. All 3 of them have totally different personalities, but they really are sweet dogs!! They had much needed baths, pedis and manis which they tolerated really well!! Attached is a photo of the 3 of them on the ride home. These three are now in their loving foster homes. Buddy is going to Julie in NYC, Sparkira to Linda on Long Island. boil turn it on low and let it simmer for an hour. size that a can of dog food would be ( about 13 ounces each portion ). make a whole bunch and freeze it as well. and have soup myself LOL !! It's really good. and has all the vitamins in there that the food I make might not have. 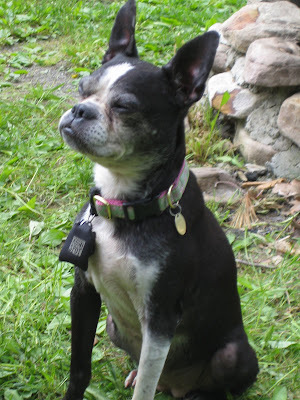 I have another good recipe that I discovered when one of my rotties was in heart failure. She was on Lasix (a diuretic for excess fluids and for the heart failure). It's called my Banana Mash. Mash the bananas and tufu in a bowl (or in a blender at low speed). This high protein and potassium recipe can be served for breakfast or a topping for those who use kibble dog food (spoon full). At least you don't have to cook this one!! Grind your apples and carrots and add any greens you want in the food processor. Then add your whole wheat flour and rolled raw oats. Add eggs to make a dough.&nbs p; Fill a mini muffin pan with the dough or spoon fill it on a baking sheet and bake at 350 degrees for 30 minutes. They will harden and then will keep for two weeks in the fridge. I have 7 dogs so I have to double and triple every recipe. Yes, you can leave them in a treat jar for a week or so but remember you have no preservatives in these cookies. They will keep in the fridge about 3 weeks so if you can't use them by then, you can freeze them. As far as your dogs getting fat, well if you gave them 10 a day, maybe (lol) but really there are no fattening ingredients. I use them for breakfast because my dogs eat their meat once a day for dinner. If you give them any treat daily, and after a week you see expanding waist lines, you're over doing it. This is my winter recipe for dog cookies. May your dogs enjoy!